One of the most famous stories about the fragility of existence and identity is told by Mozart‘s opera »Così fan tutte«. 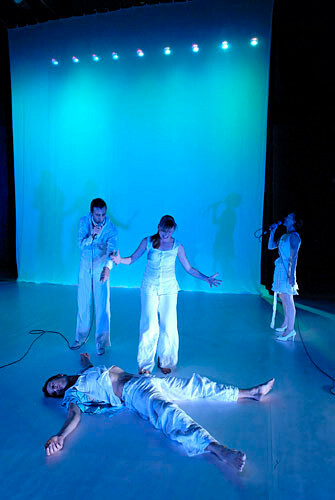 Dance company COCOONDANCE, located in Bonn, takes this well-known story as starting point for their own reflection on truth and authenticity, and the illusion of the theatre. "This everlasting game with false dreams about true emotions has been produced by choreographer Rafaële Giovanola and her company COCOONDANCE in their latest production Real-Lies. The result at the theatre would have delighted Mozart for its shrewdness and perceptiveness (...) For all the interlockings, Giovanola and dramaturge Rainald Endraß have invented unusual figures with lunatic jumps, bizarre grips and dramatically exact whirls. Composer Jörg Ritzenhoff has created an off -beat sound track from the Così-interpretation by conductor René Jacobs and diverse pop songs that could hook people to opera." "Bonn's fine dance company COCOONDANCE has got involved with the tricky story from the gallant times with beautiful subtlety. 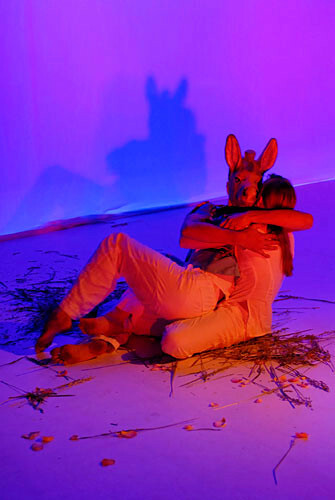 (...) The choreography by Rafaële Giovanola refers sensibly to the opera in her search for truth or production. She has translated the constellations brilliantly (...) After two, three parts, Mozart‘s music is replaced by an electro-acoustic space composition by Jörg Ritzenhoff , which, together with the speaking voices, forms a work of art in its own right." 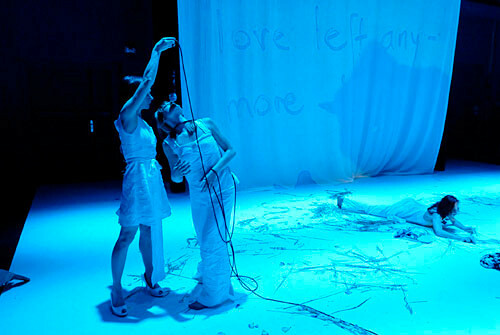 "Starting with the story about deceit and betrayal, the company does not only question the nature of love, but in addition the illusion of theatre, by breaking repeatly through play and reality. (...) Thus, the whole madness that love without fail entails, becomes feasible; and this with the easiness of a video clip. 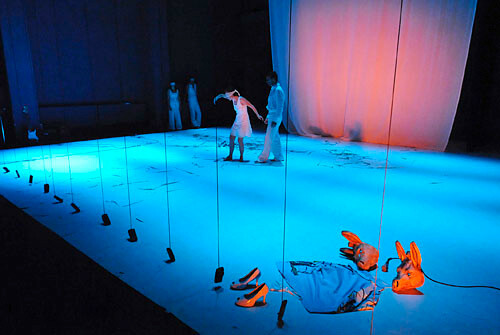 (...) Although the dancers of COCOONDANCE are highly professional, real-lies - cosìfantutte retains the slightly brittle, makeshift charm of independent productions. However, at the end the impression prevails that the strong theatrical elements are at the expense of the dance elements. And one would like to experience more of the dance because of the powerful energetic and at the same time light and cool dynamics of the dance style." "Cosi fan tutte is here, you see and taste it in REAL-LIES by dance company COCOONDANCE, who performed last weekend at Scenario Publico. The piece is opened by a very cynic Don Alfonso, dressed in white linnen. He dominates and manipulates the four protagonists with their bound eyes, hidden behind a curtain made of fifteen dictating machines. The fifth protagonist – without eyes bound – is Rafaele Giovanola. 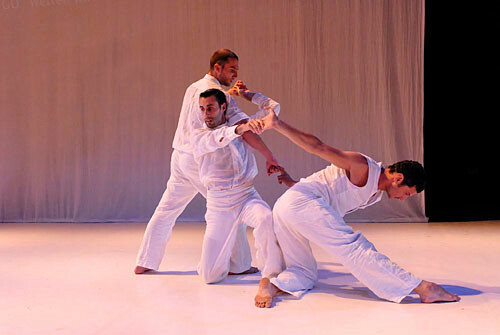 Following the example of Jiri Kylian, this inventive and ingenious choreographer knows how to bring craziness and emotion in line within a performance. She is the one sitting behind the director’s desk, where later, the lines by Carlo Da Ponte can be seen. (…) Fiordiligi – Viviane Escale – distinguishes herself through her irresistibly funny performance from the other, nevertheless well-talented dancers Stenzenberger, Boar, Guist, and Inthamoussu, who is dancing a solo-part for body and voice and panting in Spanish: Do you really think you know more than I do?"